joy magnetism: Happy #Loveswept Day! In junior high and high school, I loved Duran Duran, my band director, soap operas and my Loveswept authors. I wrote to John Taylor, wrote a letter to the editor in our hometown paper about our band director, joined the Frisco & Felicia fan clubs and even wrote a screenplay featuring Frisco & Felicia & Sean. But I also wrote a letter to the editors of Loveswept to find out how I could do what they do - not to be a writer, but to be an editor and work with my favorite authors. No response, but a decade later, I became a Loveswept editor, getting my dream job very early on in life. I never wanted to write, but I worshipped Loveswept authors like Iris Johansen, Kay Hooper, Peggy Webb, Joan Elliott Pickart, and dozens more. It was a fabulous job, working with the later generations of Loveswept authors, and really, just an honor for me - and my seventh grade self. 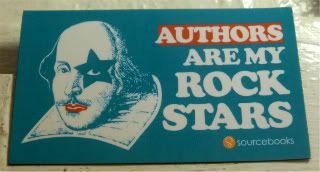 Because it's true, this magnet from my friend - they were my rock stars growing up - and I won't lie, they're my rock stars now. Now that Loveswept has been relaunched today as a digital imprint, I'm looking forward to discovering more Loveswept rock stars. Just as soon as I get an eReader. That's a whole other magnetpost!